#2 in our “Omni” three-volume compilations of Liaden Universe® novels. These are the “origin” novels in the breakthrough, hugely-popular Liaden Universe® space opera series! Across a fallen galaxy, the Liaden have risen to take on the challenge of bringing trade and civilization to the stars and, in the process, made themselves the aristocrats of known space. Adventure, intrigue, romance – on an interplanetary scale! The three Liaden Universe® universe “origin” novels collected together for the very first time in one omni edition! Across a fallen galaxy, the Liaden have risen to take on the challenge of bringing trade and civilization to the stars and, in the process, made themselves the aristocrats of known space. Bred to scout, to pilot and to trade, Clan Korval is ascendant among other families arrayed within the incredibly intricate and formal Liad social structure. But along the way Korval makes powerful enemies. Lee and Miller quite simply set the modern standard for full-on, audacious space opera. The galaxy is in danger. A mysterious alien race of energy being called the shereika is rapidly unmaking – dissipating, lock, stock and quark -- entire star systems. Humans are making their last stand. M. Jela is a top-of-the-line of soldier who realizes the peril and persuades a talented space ship pilot named Cantra yos’Phelium to help what humans remain to escape to an alternate reality with unpopulated, but livable, star systems: the Liaden® universe! Cantra is revealed to be no merely a great pilot, but a genetically engineered aelantaza, or assassin and spy whose specialty is taking on the entire personality of her “cover,” so much so that she believes it herself. She remakes herself, as only a aelantaza can, and infiltrates the scholarly towers on the university world of Landomist where she narrowly avoids being killed in scholarly conflicts. There she liberates the scholar Liad dea’Syl, along with the equations for escape stored inside his head. Once in her new domain, Cantra creates a hereditary alliance to protect her child by Jela – to be known (and become legendary) as Clan Korval. Young Jethri Gobelyn is a young Terran, working on his family's trading spaceship. Jethri has ambition, and he sets out to make a name for himself in the time-honored fashion of his family by investing in a trading scheme with what he takes to be a bona fide Liaden® master trader. But when Jethri discovers he’s been had, Jethri must master the intricacies of Liaden society, which include many formal rules and regulations of behavior, to regain his place – and face – within the clan. Sharon Lee and Steve Miller live in the rolling hills of Central Maine with two insistent muses in the form of cats and a large cast of characters. The husband-and-wife team's collaborative work in science fiction and fantasy include twelve novels and numerous short stories in their award-winning Liaden Universe®. 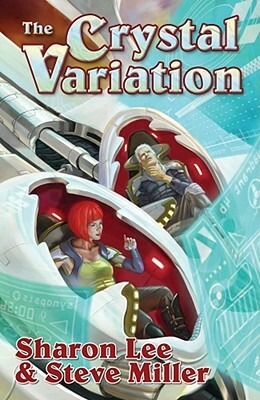 In addition to their collaborative work, Steve has seen short stories, nonfiction, and reviews published under his name, while Sharon has published short stories, newspaper pieces, and two mystery novels, and, most recently, Carousel Tides, from Baen.